From the New York Times bestselling author, Paper Towns is soon to be a major motion picture (Summer 2015) starring The Fault in our Stars sensation Nat Wolff and Cara Delevingne. Quentin Jacobsen has always loved Margo Roth Spiegelman, for Margo (And her adventures) are the stuff of legend at their high school. So when she one day climbs through his window and summons him on an all-night road trip of revenge he cannot help but follow. But the next day Margo doesnt come to school and a week later she is still missing. Q soon learns that there are clues in her disappearance and they are for him. But as he gets deeper into the mystery – culminating in another awesome road trip across America he becomes less sure of who and what he is looking for. Masterfully written by John Green, this is a thoughtful, insightful and hilarious coming-of-age story. 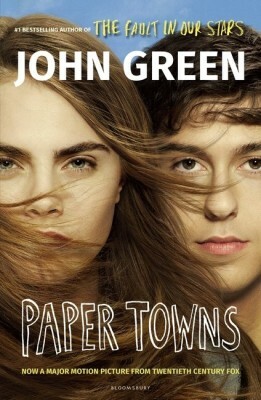 Paper Towns the film will be released in 2015. About the Author John Green is the New York Times bestselling author of Looking for Alaska, An Abundance of Katherines, Paper Towns, and The Fault in Our Stars. He is also the co-author, with David Levithan, of Will Grayson, Will Grayson. He was 2006 recipient of the Michael L. Printz Award, a 2009 Edgar Award winner and has twice been a finalist for the Los Angeles Times Book Prize.